This thesis addresses English-language architectural theory discourse. It is an interrogation of the intellectual history of architectural theory language. While explicitly a contribution towards understanding a discrete discursive territory in existence in 1969, the study’s significance extends to the broader fields of architectural writing and design. The thesis investigates one text: Charles Jencks’s "Semiology and Architecture", chapter one of Meaning in Architecture, an anthology edited by Jencks and George Baird. This single text is taken as a case study: it is used to assess the significance and functioning of the language and structure of address of so-called architectural theory. The thesis focuses in particular on the diagrammatic figures within "Semiology and Architecture". Highly formal extensions of Jencks’s written body, the figures concentrate attention on the message as matter, and encourage an analysis directed towards the text’s paradigmatic axis. The figures’ conspicuous in-text presence helps denaturalize names and reify concepts, modifying the communicative role of each of these linguistic units. This thesis argues that the figures and names, thus understood, change the fundamental nature of "Semiology and Architecture". Under their influence, the referential function of the text — that aspect supporting the argument — is repeatedly usurped by the poetic function. This pattern acts to disrupt commonsense assumptions regarding authorship. In place of a distinct Jencks, the thesis extracts authorial constructs or personas. This thesis uses the poetic function of Jencks’s text, and its authorial constructs, to characterize the underlying discursive formation. Each of the thesis’s five body chapters performs the same set of operations. One or two figures are isolated; Jencks’s argument as determined by referential function is traced, and the paradigmatic selections demonstrative of the poetic function analyzed; the relevant textual constructs are exposed; and the discursive functioning is characterized, significance thus articulated. 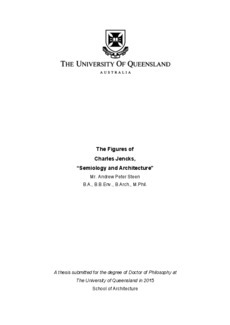 Through close textual analyses, this thesis contributes novel understandings of Charles Jencks, "Semiology and Architecture", and the ongoing practice of architectural writing. It advances historical and theoretical arguments: it addresses the function of the author and the process of writing within architecture’s discursive formation, and advocates for the significance of formal textuality in studies of architectural theory.